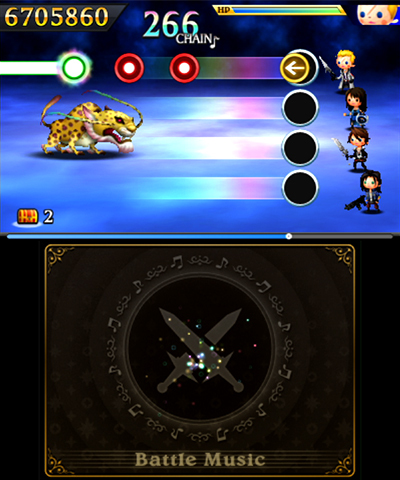 Theatrhythm Final Fantasy Curtain Call from Square Enix is a lot more fun the more challenging it becomes. 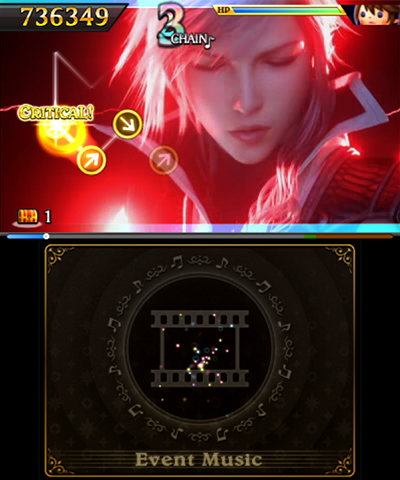 There's a certain kind of Final Fantasy fan Square Enix made Theatrhythm for - the music lover. Music in various Final Fantasy titles is celebrated for a reason. It's memorable, it's catchy, and it's beautiful. 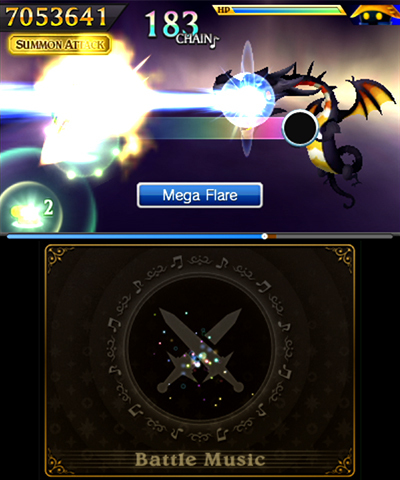 Playing Theatrhythm consists of listening to your favorite songs, watching cinematics in the background, and tapping the stylus to the screen in rhythm. 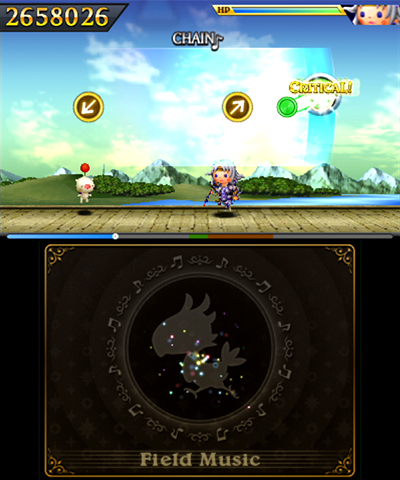 Theatrhythm Final Fantasy Curtain Call is easy to pick up and play, and it's well suited to the 3DS thanks to the stylus and touch screen. There are three difficulty settings from easiest to hardest: basic, expert, and ultimate. Don't get nervous over the last two settings' names. I was able to take on the ultimate mode without too much difficulty after one stage each on basic and expert. Songs are classified as one of three stages: battle music stage, field music stage, or event music stage. 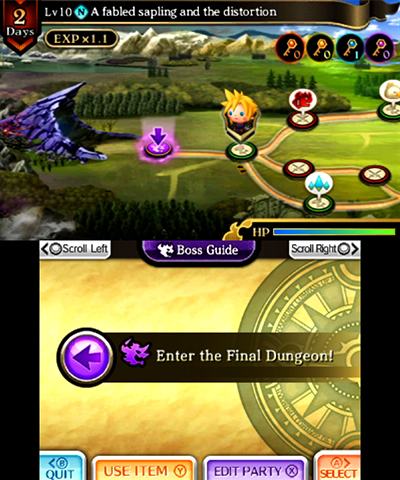 In the battle stage, you must keep track of four lanes and tap the screen, slide the stylus in a specific direction, or hold the stylus to the screen in time with the icons on the screen. In battles, it does not matter where you touch the screen as long as it's in time. In traditional rhythm game style, the closer in time you match the trigger, the better you perform. Field music stages add another element; now you must move the stylus up and down to follow a line displayed on the top screen. 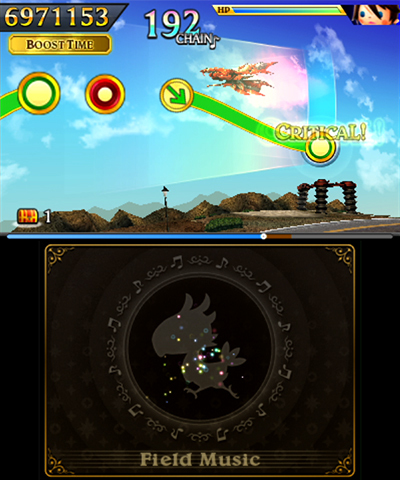 Event music stages use elements from both battle music stage and field music stage. A guide line will move around the top screen, and you react to triggers as the mark moves over them. Your placement of the stylus does not matter in event music stages, making it a little easier than some field music stages. 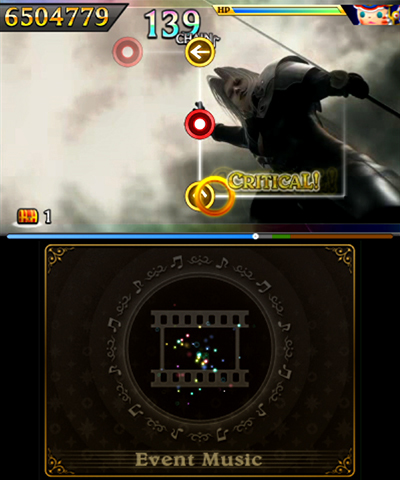 Theatrhythm succeeds when the triggers are in time with the music. This seems to only occur on the ultimate difficulty, which means you'll be swiping and tapping away at the screen much more frequently and therefore paying more attention to the music's rhythm. Final Fantasy fans will enjoy engaging with the music, but it's still just as accessible to rhythm game fans with limited knowledge of the Final Fantasy series. 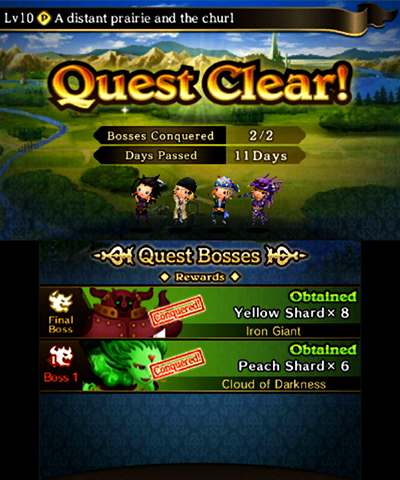 It wasn't a particularly exciting title, but it was definitely more enjoyable the more challenging the difficulty. 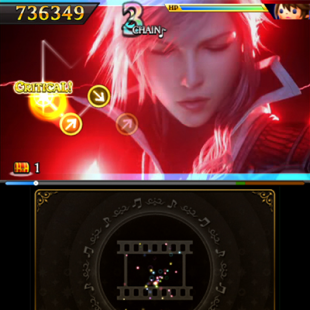 Theatrhythm Final Fantasy Curtain Call launches September 16 on the 3DS.